17 Jun A Sydney craftivist uses us as inspiration for her degree show and beyond! 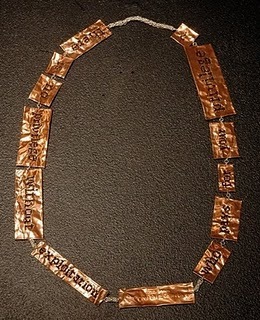 We received the following email from Georgia, a Sydney-based student using Craftivism and the Collective as inspiration for her arts degree show project, shown above. Read the full letter after the jump. Date: Thursday 20th May 6pm. Venue: Exhibition Road, London. Look out for the big ceramic elephant pictured below. All welcome We have our London monthly meetings every 3rd Thursday of the month. 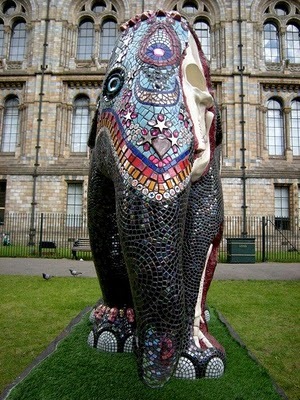 The next meeting is Thursday 20th May 2010, 6pm start and will be a bit different: Instead of meeting at Royal Festival Hall cafe for this monthly meeting we thought we could go on our first trip to see one of the most beautiful pieces of UK Craftivism around: Carrie Reichardt and Nick Reynolds mosaiced elephant called Phloon which is on Exhibition Road on the grass where the Natural History Museum joins the Science Museum. Here Carrie will talk to us about her inspiration, technique and story of her craftivism background. We will end the meeting by going for a cuppa to discuss help with the first ever UK craftivism zine we are making and general chit-chat. Sarah Corbett: I love being the one who gets to check our Craftivist Collective email account because i get to be the one who reads all the lovely emails of encourage and praise we get and i get to reply to all the cool people who want to work with us, include us in their zines, events, etc. 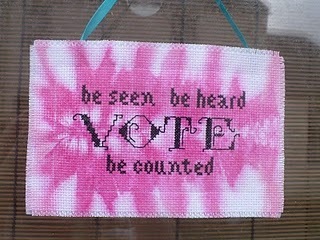 During the election period one of our craftivists Rosa created cross stitch patterns encouraging people to vote. The London group made some during our April meeting and we encouraged others do to so remotely. One of those lovely people not at the meeting is Sadie from Scotland. Sadie emailed me her beautiful craftivist creation and a little bit of blurb on it to add to our blog here. So please read her thoughts and check out her lovely blog. Hi :-) My name is Sadie and I live in a small village in the south-west of Scotland. I am a novice craftivist. I stitched this at the weekend and now have it hanging in my window for passersby to see. Here's why I did it. 11 Apr We are in the introduction to the re-release of The Subversive Stitch! 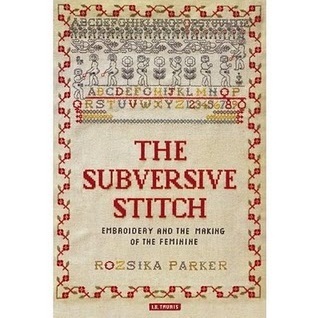 The Subversive Stitch is the seminal book on embroidery and feminism. The book was first released in 1984, so it has been updated for this release. An introduction sets the scene, explaining how the world of Embroidery has changed since the release, and most importantly- its current state. And in that introduction you will find us mentioned! It's a privilege to be in a book alongside Mr X Stitch and Tracey Emin. Date of Pop Up Shop duration: 13th March- 19th April. Venue: 10 Newburgh Street, Carnaby, W1F 7RN. You can buy our Mini Protest Banner kits and postcards in the shop. Date of Craftivist Collective presentation: on the history of the Craftivist Collective. Monday 5th April 2pm, downstairs (free) all welcome RSVP here Date of Craftivist Collective workshop: Thursday 9th April 3pm (free) open to all. Making Mini Protest Banners on the themes of unethical fashion and sweatshops. 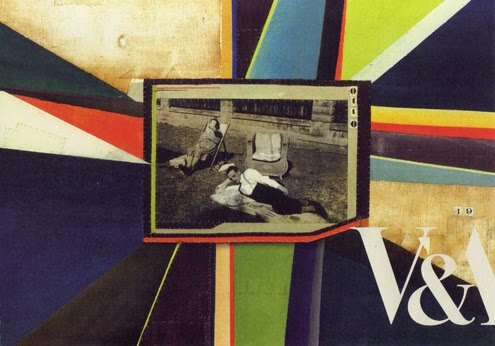 Sketchbook magazine focuses on fashion, arts and illustration. Members of Sketchbook set up a pop up shop for 3 weeks in a beatiful shop space 10 Newburgh Street off Carnaby Street London. In the space Sketchbook members drew on the walls, had film booths of short art films surrounded by artwork painted onto the walls. Rosa Martyn writes: The Victoria and Albert Museum, South Kensington is craftivism's closest ally. A huge building filled to the brim with all different crafts from all across the ages, it rejoices in handmade. It was very fitting then, for the V&A to celebrate the art of quilt making across the centuries - and at its heart, not stated- but definitely present: craftivism. 20 Mar April project and meet up: Encourage people to Vote! 18 Mar Our first exhibition! Sarah Corbett writes: The lovely curators at Ink-d Gallery in Brighton invited us to be part of their exhibition with the help of a nudge from the incredible craftivist Carrie Reichardt who specialises in mosaics and ceramics. 5 of our mini protest banners are hung in the gallery underneath 5 framed prints of photographs of the mini protest banners in a public space that links to the issue discussed.